This gratin dauphinois is inexpensive and simple to make. This version uses low fat milk, as opposed to whole milk, and light cream, instead of heavy cream or creme fraiche. I think serving it in individual gratin dishes classes up the meal in terms of presentation. Recently, I was in a restaurant supply store in the District and stumbled upon some gratin dishes I really liked. They were the right size and the right color for just $3.99 each. For two persons, take two large russet potatoes (between 1 1/2 to 2 lbs) and cut them into 1/8" to 1/4" slices. A food processor or a mandoline slicer is helpful here. Put the potatoes in a large pot or pan and cover with 2-3 cups of low fat (not skim) milk. Add a dash or so of salt and bring to a boil over medium to medium-high heat. Reduce the heat to low and continue cooking the potatoes for about 10 minutes, stirring occasionally. In the meantime, rub the inside of a baking dish or individual gratin dishes with crushed garlic cloves. Next, rub the inside of the baking dish or individual gratin dishes with unsalted butter. Drain the potatoes and layer half the potatoes along the bottom of the baking dish or gratin dishes. Sprinkle grated gruyere cheese over the potatoes and then some fresh thyme leaves and salt. Splash some light cream on top. Add the remaining potatoes and repeat with the cheese, thyme, salt and cream. Place the baking dish or individual gratin dishes in a preheated 350 degree oven for about 30 to 40 minutes. Remove from the oven when the top or tops become golden brown and the edges bubbly. Let sit for about 5 minutes before serving. Beautiful. 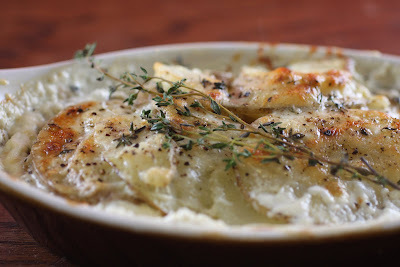 I have always loved scalloped potatoes so I will try this as soon as I can get some fresh thyme leave. Brilliant, I've been looking for a good and easy recipe for this for a while. Can't wait to try it out!